N ational Mobility Awareness Month comes and goes with some people unaware it's even happening. I'm guilty of enjoying the silly holidays like National Wine Day (May 25) and National Splurge Day (June 18), but when an important awareness event comes along like this, it's difficult to know what to do to "celebrate." The National Mobility Equipment Dealers Association (NMEDA) makes it easier with their Local Heroes Contest. A Local Hero, in this case, can be defined as someonewho volunteers, educates, advocates, achieves and perseveres. Maybe this person is living with a disability, or maybe they dedicate their time to helping someone who is. All you need to do is tellNMEDA what makes you, your best friend, your neighbor, or your teacher a Local Hero. Three fully converted wheelchair accessible vehicles (including one from BraunAbility!) will be given away to the winners, one to a senior (60+ years of age), one to a caregiver, and one in a general category.April 12 was the opening day for story submissions, which will be accepted up until May 31. NMEDA requires either a written story or a video story to enter. Explain how winning a vehicle may change your life or the life of the individual you are nominating. You can even get a code for extra votes when you register to find a mobility dealer nearest you. So far, Jessica Blinkhorn is the first public video submission on YouTube. If you need ideas on how to get started, this is a great example. Or, if you'd like, vote for Jessica to win her own van! Colleen Van Noord saw a Fox 17 story about the NMEDA Local Heroes contest and decided to enter. Last August, she took ownership of her custom BraunAbility vehicle and said, "Sitting inside, it looks just like anybody else." Colleen and her van, appropriately named Van Gogh, go everywhere now, enhancing her quality of life and independence. It's easy to celebrate the silly holidays, but sometimes the serious issues can be harder to talk about. However, that's exactly what needs to be done! Nearly 1 in 5 Americans have a disability, with half reporting the disability as severe. But the Local Heroes contest could help people like Aiden spend more time outside of the house with his family. It could keeppeople like Tamberly from hurting herself as she moves her daughter in and out of their van. And it could help Gracekeep up with her extracurricular activities and group of friendsmore easily. 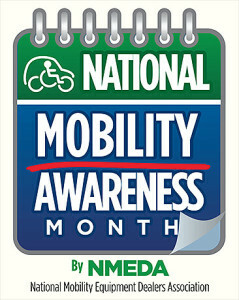 May is National Mobility Awareness Month. This year, don't let it pass by uncelebrated. Submit your Local Heroes or vote to change someone's life!